New Delhi: After a glorious career leading Australian team and inspiring youth across the world, Michael Clarke, the international cricket sensation is back to inspire young minds. 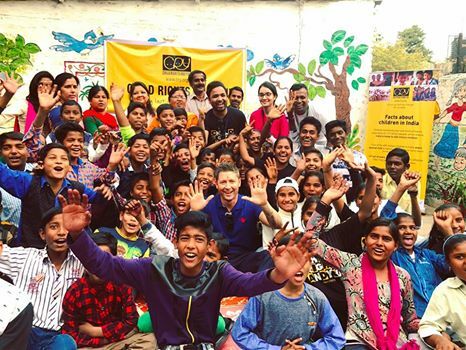 This time, underprivileged children from CRY – Child Rights and You projects in slum areas in Delhi. The event, held at a CRY supported project in Kanakdurga slum of RK Puram, saw the former Australian skipper interact with about 50 children, who could barely hide their excitement. He emphasized on the importance of education and encouraged them to never give up on their dreams. The highlight of the day was his interaction with a team of passionate, bright, young women from CRY supported project Saksham in Shahbad Dairy, who have formed a cricket team of their own. A friendly game of cricket was played with the girls, who had been eager to show their skills on the field. Michael Clarke gave them valuable tips for the game as well as important life lessons. He commended their spirit and encouraged them to keep following their dreams. The Vice Captain of this team, the once shy, Tanu, confidently showed off her playing skills today, in front of the cricket star of international fame. She has recently been selected to represent J&K team in a state level tournament. Cricket has proved to be a medium of empowerment for these girls, living in the Shahbad Dairy area of outer Delhi. It has given them a sense of equality in the community and motivated them to stand up for their rights and work harder for a bright future. One could see, how all of them looked up at the cricket star, inspired, and hoping to represent India at an international platform someday. The children at the event could hardly contain their excitement as they huddled for photographs and autographs. This is a day they are likely to remember for the rest of their lives.